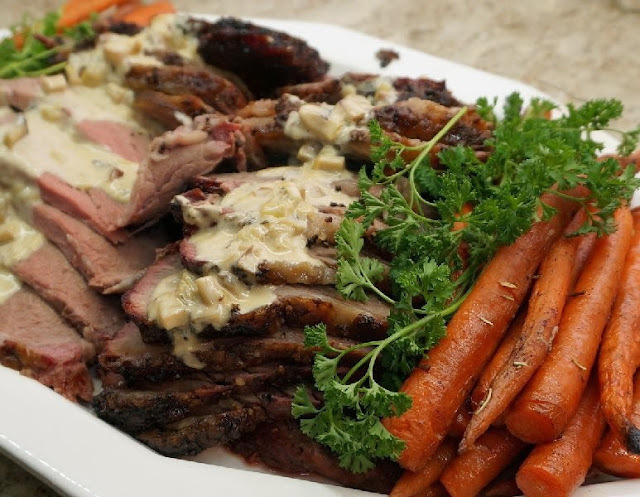 This Mushroom and Leek Sauce turns a Roast Beef dinner into a special occasion meal. Melt 1 tablespoon butter in a frying pan and add the finely chopped mushrooms. Saute' until mushrooms are soft. Remove to a bowl and set aside. Add remaining tablespoon butter to pan and saute' leeks over medium heat adding butter if pan is dry. Do not brown them. Add mushrooms back to the pan and pour in chicken broth, rosemary and thyme, and salt if needed. Add cream and black pepper, continuing to simmer for about 20 minutes, stirring occasionally until sauce is reduced to around 2 cups. Check seasonings, adding salt and pepper if needed. This looks scrumptious, even the carrots!! Are the leeks finely chopped too or sliced? I have not used them before and am unfamiliar with their texture. Sounds great! I cut the leek in half, wash it out and then for this recipe I make several more lengthwise cuts and then slice it finely. I know we'd enjoy this, Bev. Yum!